The French Muse Experience is for anyone who would like to visit Provence by following their heart, by indulging their senses, and through experiencing first hand what we have lived for years. The ever changing landscape dipped in color – that scents our table and dances through our lives. We bring our guests off the beaten track and deep into the soul of this beautiful country, soaking up history and heritage at our favourite flea markets, and meeting and connecting with its finest artisans, makers and collectors. Every day lived in Provence is a day of beauty, filled with tantalising flavours and enduring inspiration – let me share it with you!. Our week long French Muse Experience is crafted to let you connect with Provence in all its beauty; the landscape; the colourful texture of the regions; Provencal meals to swoon you to the next mouthful; visits with the creatives and artists who call Provence home and to our famous flea markets (brocantes), where history is unrolled through linen, pottery, paint, nail, wood with abundant creative style. Throughout the year we create very special creative workshop retreats with invited artists, photographers, floral designers, natural dyers, and fiber artists. July 3-7 2019; Summer Gathering: Forage Feast Photography. Limited places available! October 8-15 2019: French Muse Experience - now open for registration. May 5-12 2020: French Muse Experience - now open for registration. For more information on our bespoke retreats click here..
A very special 5-day visual storytelling retreat which will be a wholehearted sensorial celebration of food, photography, visual storytelling, creativity and cooking. This retreat is open to all levels from beginners to intermediate level photographers. A Mediterranean feast for our last evening. The goal is to create a very intimate, immersive and transformative experience which celebrates creativity, kinship, community, and collaboration…. Workshops will rotate in small groups (4-5 max) with plentiful practical workshop time. Perfect for anyone who is interested in creating lifestyle and food photography but also suitable for creatives with an interest in cooking and travel. Photo credit Top to Bottom: Valentina Solfrini, Aimee Twigger. For those of you already planning to come to Provence on vacation, perhaps you are in need of a little help in organising a special day of activities? Then why not try a Mini Muse experience ? Perhaps you would like to spend a day learning how to ‘brocante’ like an expert, or you need help planning a special gathering, a picnic in a cherry field, or a vintage themed luncheon? Or perhaps your would like an invitation to discover the hidden worlds of important local makers and artists? Just enter your email below to receive our monthly newsletter with personal travel guides, news, promotions and more right in your inbox! Every day lived in Provence is a day of beauty, filled with tantalising flavours and enduring inspiration. 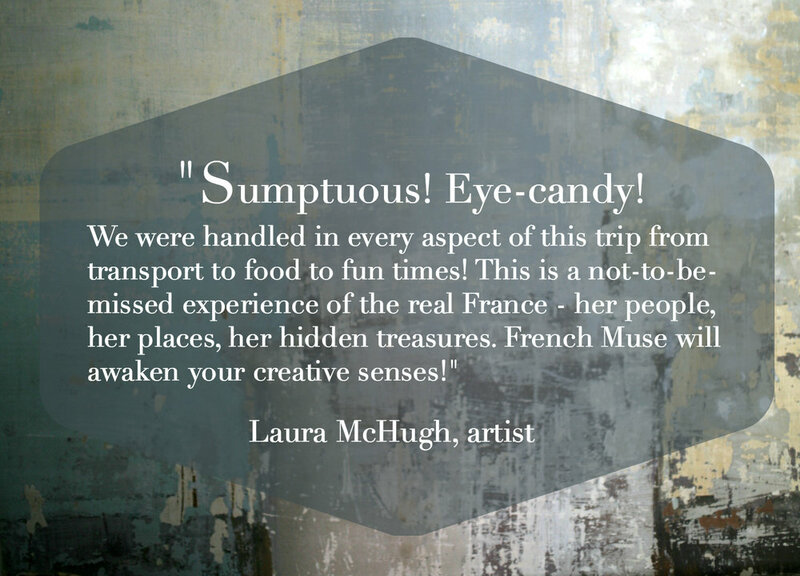 I founded the French Muse as an invitation to delve deep into the soul of this beautiful country, soaking up the history, the colour and light; and of course meeting and connecting with its finest artisans, makers and collectors. For me, The French Muse is about travelling deeper, seeking thoughtful and singular journeys that get to the heart of Provence and its culture. In 2015, I felt this need to create a more authentic and exclusive travel experience, which was focused on nourishment, creatively and physically. It's genuinely exciting to be the conduit that brings people together from different generations and backgrounds, to create an experience where it is essentially about meaningful human interactions and connections. Take a leap and join me!